Tom Cruise publicly declared his love for Katie Holmes back in 2005 on Oprah. The whole performance was excruciating to watch from his apparent inability to sit still and string a sentence together to him jumping on the talk show hostess’ sofa. I dismissed the whole performance as a bad publicity stunt because no one jumps on sofas when they are in love. Boy, was I wrong…. 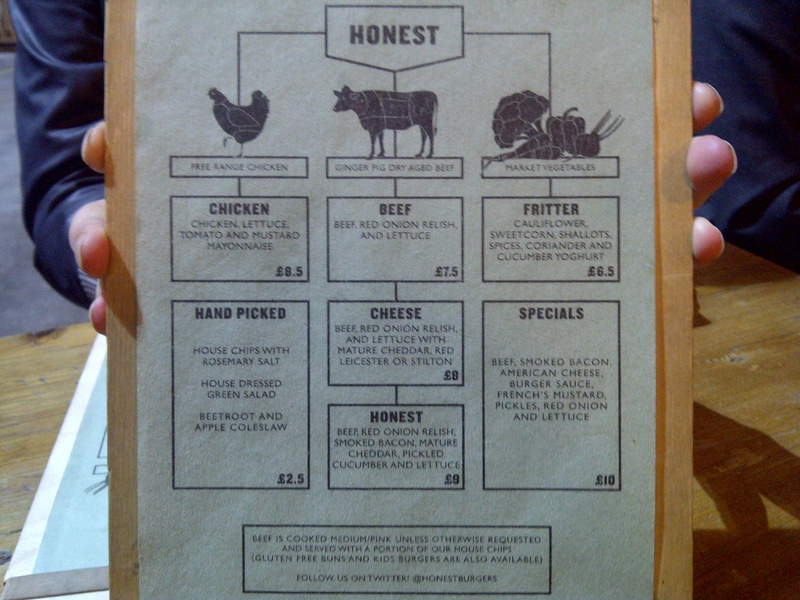 Last week I went to Honest Burgers in Brixton with my sister and her flatmate. We arrived at the restaurant and were told that there would be an hour’s wait for a table. I was more than happy to wait as my sister assured me I was in for a treat. They took our number and texted us when a table was ready. An hour later and a couple of drinks down we were seated and perusing the menu. Three options: chicken, beef, vegetable fritter. If you chose beef you had a choice of a standard, cheese, honest or special burger (see menu). I went for a good old-fashioned standard number. The bun was soft but this did not compromise its structure, slightly sweet and had a lovely shine on the top. The burger was pink in the middle which meant it was lovely and juicy and full of flavour, complimented perfectly by the red onion relish and a bit of crunch from the lettuce. “Best chips in London” according to my sister and she is not wrong. Not too thin, not too thick. A bit of skin still on the occasional chip giving them a very homemade feel. And the pièce de résistance was the light seasoning of rosemary salt which added a whole new dimension that blew my mind. So this is me jumping on a sofa and declaring my love for Honest Burgers. This place is really something very special. Situated in the market the atmosphere is fantastic; its size means it is friendly and intimate and the staff are genuine and helpful. Considering Tom and Katie are sadly no longer together, I will give this a 9.99999999/10 just in case I meet a better burger at some point in the future. A girl has to keep her options open.